There's something very satisfying about running a household. I'm not an expert and things don't always go as smoothly as I'd like, but I'm often proud of how efficiently I meal plan, how my grocery shopping schedule works, how well we're always fed and how we keep our house clean-ish most days. Mostly I'm happy that my home is a home. It's filled with happy memories and lots of love. I'd love to be able to put some of my household successes on my resume because, in my opinion, those are the successes that count the most. While listing off things like meal planning and grocery shopping might seem trivial--a little order goes a long way in keeping the home a happy place. 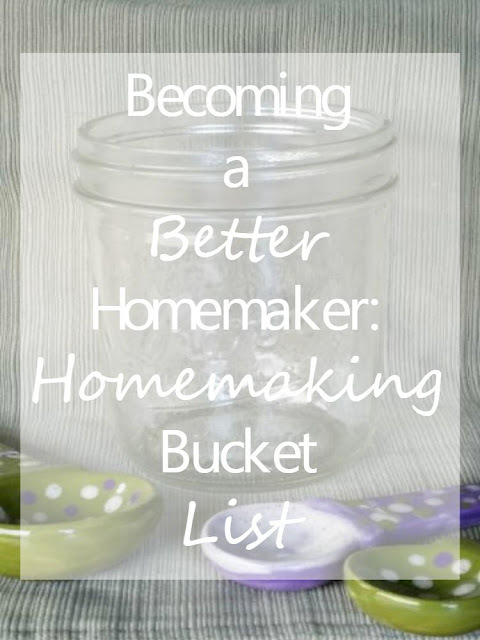 Whether it's trying to cut the budget down, use more natural ingredients in food and other household products, make wholesome and delicious foods,or whatever else--I have some things to learn when it comes to homemaking. I want to be primarily in the home--for an indefinite amount of time. (Yes, even when my kids go back to school and maybe beyond. My reasons for that are many but I'll save that for another day-maybe?) I feel like there's so many skills that I can learn as I spend my time at home. It's not easy with a toddler, but she loves to accompany me to the store and she's a great helper so I can include her in most of my bucket list items. I've attempted this twice now and the recipes just haven't worked. I'd like to try Jana's recipe for homemade scented sensitive laundry soap. I found a recipe for liquid dishwashing detergent and a recipe for homemade dishwasher tabs. I want to find a way to grow an herb garden that works for our home--and our lifestyle. Some of the herb garden ideas I like are found here, here, or here. After successfully creating and growing my herbs, I want to really develop an understanding of what I can do with those herbs and I want to cook with them. By that I mean, I want to learn a little about canning. I want to feel comfortable canning most things in a water bath at least (Begginers Guide to Water Bath Canning). I want to learn to operate our dehydrater (it's a hand-me- down from our neighbors and very different than anything I've ever seen so I need to figure out how to use it and start practicing) (dehydrating fruit tutorial) and I want to be better about freezing food. With our garden producing I would like to really make the most of every little scrap we get. If I am learning to store food, I need to keep it stored. I also need to put more effort (even if it's just a little bit at a time) in preparing for emergencies with other toiletry items. Nothing says home like the welcoming feeling of a well-decorated house. I don't mean well-decorated in the sense that the home displays hundreds of ornate crafts, expensive wall hangings, and extremely time consuming DIY projects. I mean well-decorated in that the house displays a bit about the people that live there--what's important to them, what they like, and what they treasure. A well-decorated home, to me at least, is a home that set up to be useful--and practical. Decorating is expensive, but I have a small list of things I'd like to do--some additions to the walls, maybe a few curtains, and some throw pillows on the couch to start. A big thing for me is wanting my kids to read things in our home. I want books easily accessible and quotes on every the wall--at least on in every room. I want the quotes to reinforce important values that we hope to instill in our children. I think if I just start making attempts to really make our home show us then I will get the hang of it. What sorts of things would be on your homemaking bucket list?